Our biggest problem arose this week as a result of having to come off record for a defendant in a criminal case in the Crown Court. Our ethical position had been compromised leaving us with no alternative but to resign. However, the defendant then struggled to obtain legal representation. 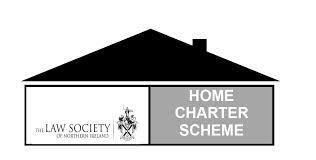 He approached a number of leading criminal firms all of whom, in light of the recent judgement in a case of Brownlee, refused to accept instructions – conscious of the fact that although this was a complex matter, only nominal costs would be paid. Even had they accepted instructions, they would probably have found it impossible to obtain the services of counsel as they suffer also in terms of remuneration. The gravity of the case was such that we had the services of senior counsel. 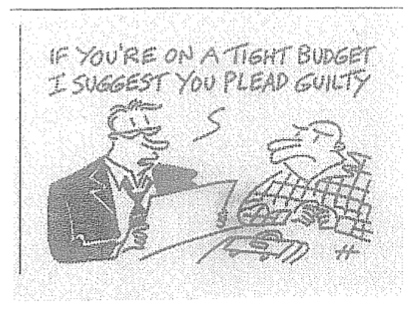 This situation is perhaps a sign of things to come as the legal aid budget faces further onslaught. It is an affront to witness a defendant facing serious charges without any representation. We only avoided such a scenario thanks to the altruism of an advocate/ solicitor who kindly agreed to deal with the case himself. The cuts are becoming so acute that one wonders if there is a hidden agenda that could irreparably degrade the quality of the justice system. Students ordered to wear goggles while they play conkers! 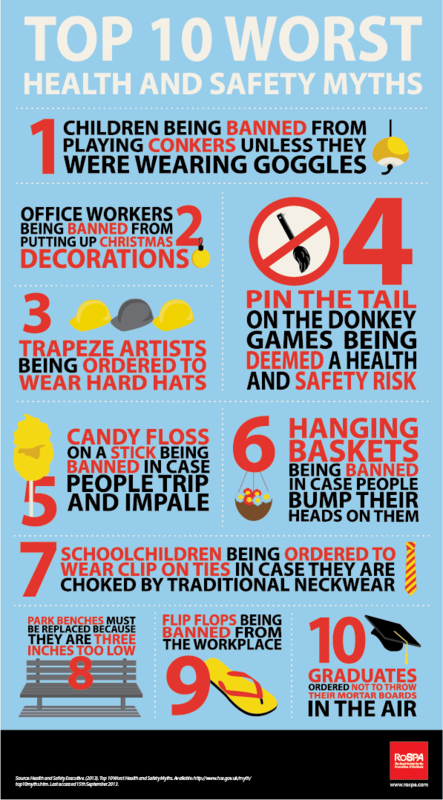 Or have you heard the one about the trapeze artist being ordered to wear a hard hat? We came across this infographic over at The Royal Society for the Prevention of Accidents blog and we thought we should share it. 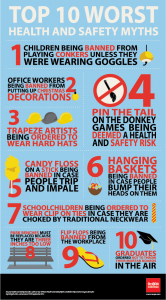 While some of them are so ridiculous they’re bound to make you smile, please remember the serious consequences this misinformation can have on people’s attitudes… and share with your colleagues so we can help to consign these myths to the joke books where they belong! Campbell and Haughey Solicitors Ltd (Lurgan, County Armagh) are proud members of the Association of Personal Injury Lawyers (APIL) – the leading organisation championing the rights of personal injury plaintiffs and protecting their position. This animated video about the consequences of tailgating has been launched by APIL. 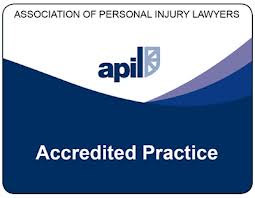 APIL aims to persuade drivers to ‘back off’ from one another to prevent crashes, needless injuries, and subsequent higher motor premiums for offenders. 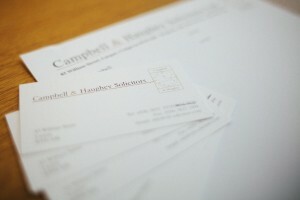 Campbell and Haughey Solicitors Ltd website close to going live!